People who saw Carl Furillo play most often talk about his throwing arm. He was given nicknames because of it, including “The Reading Rifle,” and “The Arm.” On August 27, 1951, Pirates pitcher Mel Queen learned about Furillo’s arm the hard way—thrown out at first base after hitting an apparent single to right. It was one of Furillo’s twenty-four assists that season. In his career, he threw out seven men who rounded first too widely, throwing behind them. Another of Carl’s nicknames was Skoonj, short for one of his favorite foods—the Italian seafood dish scungilli, the edible part of an aquatic snail. 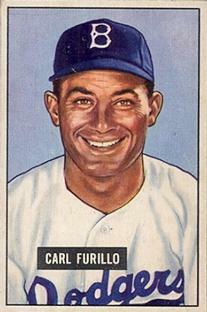 Furillo, who batted and threw right-handed, was a .299 career hitter and a batting title winner in 1953. Nevertheless, people wanted to talk about the way he played the right field wall at Ebbets Field. The wall was nineteen feet high, with a nineteen-foot screen on top (which was in play), and the scoreboard with a Bulova clock atop it sat in right center. The wall was concrete and concave, a vertical top half and an angled bottom half. According to Philip J. Lowry in Green Cathedrals, there were nearly 300 angles a ball could take after hitting different parts of the wall. Carl Anthony Furillo was born in the same town in which he died—Stony Creek Mills, Pennsylvania, a suburb of Reading, on March 8, 1922. The son of Italian immigrant parents, Michael and Filomena Furillo, he dropped out of school after completing the eighth grade. His was a close-knit family, and Carl worked at various jobs, including picking apples and work in a woolen mill. However, he always played ball. After the death of his mother, when he was eighteen, he was able to leave the family to pursue it professionally. Furillo spent most of the 1940 season with the unaffiliated Pocomoke City (Maryland) Chicks of the Class D Eastern Shore League, batting .319 and slugging .523 in seventy-one games. His salary was $80 a month. Furillo was a center fielder, but he also pitched in eight games, compiling a 2-3 record. That season, he also played eight games for the unaffiliated Reading team of the Class B Interstate League. After the 1940 season, the Dodgers purchased the Reading club, including its twenty players and two sets of uniforms. Carl moved up to Montreal of the International League in 1942 and batted .281. He was the second youngest player on the team, and the most prominent future major leaguer on the Clyde Sukeforth-managed squad. The Army called, and Furillo missed the next three seasons. He served in combat in the Pacific Theater, received three battle stars, and was wounded. Peter Golenbock says in his book Bums that Furillo turned down a Purple Heart medal for his wounds, saying he hadn’t been sufficiently valiant. On January 22, 1946 Furillo reported to Sanford, Florida for “advanced training” designed for returning servicemen. According to Carl, he was offered a contract of $3,750 to play with the Dodgers, and when he balked, manager Leo Durocher told him, “Take it or leave it.”3 Salary was one of several areas where the rookie and the manager had conflicts. On Opening Day 1946, Furillo was the starting center fielder, batting sixth. He went 2-for-4 in the Dodgers’ 5–3 loss to the Boston Braves. Brooklyn finished the season in a tie for first place with the St. Louis Cardinals. Furillo played 103 games in center field and 117 games overall, batting .284. In the best-of-three playoff at the end of the season, the Dodgers were swept in two games. Furillo went 1-for-8 with a run scored and an RBI. It was the first of nine seasons in his fifteen-year big-league career that Carl’s team finished in first place or tied for first place. With Jackie Robinson joining the club for the 1947 season, the Dodgers and their Montreal affiliate held spring training in Cuba, the Dominican Republic, and Panama. At the stop in Panama, Durocher, soon to be suspended for his connections to gamblers, got wind of a possible petition protesting the inevitable inclusion of Robinson on the Dodgers’ roster. He quashed it immediately, and that was the end of the matter. Furillo claimed that Durocher was on him because he bailed out on curve balls from right-handed pitchers. Furillo also complained about being platooned, which Durocher took as a challenge to his authority. The Dodgers won the National League pennant in 1947. Furillo played ninety-three of his 121 outfield games in center field, batting .295 with eighty-eight runs batted in. In the World Series, the Dodgers lost to the Yankees in seven games. Carl played in all the games but the second, leading Dodger regulars with a .353 batting average. In 1948 Furillo was injured in midseason and played in only 108 games. He finished with a .297 batting average and despite playing only two-thirds of the season, had thirteen assists. On July 6, Carl married the former Fern Reichart, from Reading. The Dodgers had swept the Phillies in a doubleheader in Philadelphia on the fifth, and had a night game on the sixth, from which Carl was excused. On July 20, two weeks after the wedding, Furillo suffered a broken nose and deviated septum when a batted ball hit him during fielding practice. Furillo had surgery to remove a bone chip, but required a second surgery a week later to re-break and reset the nose. He missed about three weeks, and after coming back did not play in every game. The 1948 Dodgers were a team in transition, finishing in third place. Leo Durocher resigned mid-way through the season (signing to manage the archrival Giants), and Burt Shotton came out of retirement to retake the helm. Additionally, the Brooklyn team was the youngest in the league. In 1949 Brooklyn returned to the World Series, again facing the Yankees. With Duke Snider now the regular center fielder, Furillo played 140 of his 142 games in right field and equaled his 1948 total of thirteen assists. He had his best year at the plate, to that point, batting .322 (fourth in the National League) with eighteen home runs and 106 RBI. In the September 22 game against the first-place Cardinals, Furillo had one of the finest offensive performances of his career. The Dodgers won 19–6, and Carl went 5-for-6, with three consecutive doubles, and drove in seven runs. Furillo sported a .431 average over his final forty-six games. In the last game of the season, in which the Dodgers clinched the pennant with a ten-inning, 9–7 victory at Philadelphia, he went 4-for-6, scoring two runs. Carl finished sixth in the National League MVP voting, behind teammates Robinson (the winner) and Pee Wee Reese (fifth). The 1949 World Series ended with the Yankees winning in five games. Furillo, hobbled by a groin injury suffered on a muddy field in Boston, started only Game One and Game Three, with one hit in eight at-bats. In 1950 the Dodgers finished second, two games behind the pennant-winning Whiz Kid Phillies. Furillo racked up 189 hits, good for third in the National League, and he matched his 1949 totals of eighteen home runs and 106 RBI. Defensively, he recorded eighteen assists. On June 28 of that season, Furillo was beaned just above the ear in a game against the Giants at Ebbets Field. He had belted a two-run homer in the fourth inning, and in the eighth, he could not evade a high inside pitch from the Giants’ Sheldon Jones. He was carried off on a stretcher, players from both the Giants and Dodgers at his side. Despite the circumstance of the earlier home run, the New York Times account of the beaning took great pains to state that it was accidental. Doctors ruled out a concussion. Carl was batting .325 at the time of the beaning, and finished the year at .305. In April 1951, at the Polo Grounds, Furillo got a measure of revenge with a game-winning home run in the tenth inning against Giants pitcher Sal Maglie. Furillo was used as the leadoff batter by manager Chuck Dressen ninety-one times in 1951. His numbers that season (.295, 16 home runs, 91 RBIs) were typical for Furillo, but he was not a prototypical leadoff man. He drew only forty-three walks, equaling his career-high to date. Leading off for the highest-scoring offense in the majors, he led the league with 724 plate appearances. He chipped in a career-high tweny-four outfield assists. Furillo was hitless in fourteen at-bats in the three-game Dodger-Giants playoff at the end of 1951. Giants’ players accused Carl and other Dodgers of yelling tauntingly through the clubhouse wall after the first game, insulting Durocher and the Giants. Monte Irvin said that Robinson and Furillo could clearly be heard. Furillo suffered his worst season to date in 1952. After years of threatening to hold out, he actually signed a blank contract for the season, and received a salary in the $20,000 range. Manager Dressen removed him from the leadoff spot, and he often batted eighth. Furillo’s batting average hovered around .230 for most of the year, and he finished at .247. While his fielding percentage of .988 was the best of his career, his twelve assists, impressive enough for most outfielders, were his fewest in five years. Nevertheless, Furillo was named to the National League All-Star team for the first time. His slump extended into the ’52 World Series. The Dodgers once again met the Yankees, and lost in seven games. Furillo played in all seven games, batting .174. In January 1953, Carl underwent eye surgery to remove cataracts. He responded with the highest batting average of his career, a batting title, a second trip to the All-Star Game, and a ninth-place finish in the Most Valuable Player voting. The Dodgers won the pennant by thirteen games, but lost the World Series to the Yankees in six games. Finally, Monte Irvin and Jim Hearn managed to separate the two combatants, but not before someone stepped on Furillo’s left hand. He sustained a fractured metacarpal bone. Both Furillo and Durocher were ejected, and Furillo had to dodge debris thrown by Giants’ fans as he walked up the steps to the Dodgers clubhouse that abutted the left-center field bleachers. National League president Warren Giles called Furillo into his office because of his threat, but ordered no suspensions. Furillo did not return to action until the World Series with the Yankees, his league-leading batting average frozen at .344. The Dodgers lost the Series, despite having a team that won 105 regular season games. Furillo was 8-for-24, playing in all six games and hitting a home run that temporarily tied the score in the ninth inning of the sixth and final game. Coming off his superb season, in which he made that All-Star team for the second year in a row, and in which he finished ninth in the MVP balloting, Furillo was rewarded with a contract of around $28,000 for 1954. His batting average reverted to his career norm, .294, and he hit nineteen home runs and drove in ninety-six runs for the second-place Dodgers, now under the direction of Walter Alston. Furillo’s pay was cut slightly for the 1955 season. If he was upset about it, he had the consolation that “next year” had finally arrived, and he received a World Series share of $9,768. Furillo had his best power numbers, clouting a career-high twenty-six home runs and slugging .520, his second best. He batted .314 and recorded double-digit assists for the eighth consecutive season. The Dodgers repeated as National League champs in 1956. Furillo contributed twenty-one home runs and a .289 batting average to the cause, as well as ten assists. He batted .240 in the World Series, as the Dodgers fell to the Bronx Bombers in seven games. The club moved to Los Angeles for the 1958 season. For their first four years in LA, the Dodgers played in the Los Angeles Memorial Coliseum. The left-field wall was a mere 250 feet from home plate, but a high screen was atop the wall so that short fly balls would not be turned into home runs. Furillo played in 122 games in ’58, stroking eighteen home runs and batting .290, with eighty-three runs batted in. Playing in a cavernous right field, he had only five assists. Furillo’s eighteenth and last home run in 1958 was the 192nd and last of his career. He played in only fifty games in 1959 and eight in 1960. Nagging injuries were taking their toll on his thirty-seven-year-old body: leg cramps; a cracked rib suffered in a May exhibition game; spinal disc issues; and a calf injury suffered while legging out a hit. After the last scheduled games of the 1959 season, the Milwaukee Braves and Los Angeles were tied for the league lead, and so the Dodgers were involved in a playoff for the third time in fourteen years. They swept the best-of three series in two games. Furillo didn’t start either game, but in Game Two his infield single led to the pennant-clinching run in the bottom of the twelfth inning. At thirty-seven, Furillo was the oldest Dodger on the World Series roster as Los Angeles beat the Chicago White Sox in six games. He made four pinch-hitting appearances, and his bad-hop pinch single in the seventh inning of Game Three broke a scoreless tie and provided the margin of victory in the 3–1 win. Persistent pains in his legs caused the Dodgers to place Furillo on the inactive list on May 12, 1960. On May 17 they gave him his unconditional release. If Furillo had finished the season, he would have received a monthly pension of $285 starting at the age of fifty, instead of the $255 he would now receive. He also was slated to receive $33,000 for the season, but had been paid only $12,000 of it at the time of his release. He sued the Dodgers on the grounds that he was released while injured. In August the Dodgers announced that Furillo had been hired to be an instructor at the Dodgertown Summer Camp in Vero Beach. However, Carl continued the suit. It was settled in May 1961, with Furillo being awarded the $21,000 remaining from his 1960 salary. Despite repeated entreaties to every major-league club, Furillo received no job offers as either a coach or scout. He moved the family back east, first to Reading, and in 1963, into a split-level home in Flushing, Queens. He bought a half-interest in a delicatessen, renamed Furillo and Totto’s, and worked long hours at that business for seven years. Then, he moved the family back to the Reading area and took a construction job, among other things installing doors on Otis elevators at the World Trade Center. This was hard work, out in the elements, but he planned to do it only until he turned fifty, when his baseball pension kicked in. He spent weekends with the family in Reading, and spent weekdays on the job. After the construction job was over, Furillo took a job as a security guard near his home, four nights a week as a night watchman. He later was diagnosed with chronic leukemia and died in his sleep of heart failure on January 21, 1989, forty-six days short of his sixty-seventh birthday. He was survived by Fern, his two sisters, his two sons, and five grandchildren. Former teammates Sandy Koufax, Joe Black, Johnny Podres, Clem Labine, Billy Loes, Cal Abrams, Carl Erskine, and Peter O'Malley, the Dodgers' owner, attended his funeral at Forest Hills Memorial Park in Reiffton, Pennsylvania. Eskenazi, Gerald. The Lip: A Biography of Leo Durocher. New York: Quill, William Morrow & Co., 1993. Golenbock, Peter. Bums: An Oral History of the Brooklyn Dodgers. New York: G. P. Putnam’s Sons, 1984. Kahn, Roger, The Boys of Summer. New York: Harper & Row, 1972. Kahn, Roger. The Era 1947-1957. Boston: Houghton, Mifflin Company, 1993. Lowry, Philip J., Green Cathedrals. New York: Walker & Co., 2006. 2. Boys of Summer, p. 311. 5. New York Times, April 5, 1946. 6. Opening Day, p. 44. 8. New York Times, April 16, 1947. 9. New York Times, August 15, 1947. 10. Boys of Summer, p. 311. 11. Boys of Summer, p. 312. 12. The Era, p. 314. 13. The Lip, p. 268. 14. New York Times, September 7, 1953. 16. Boys of Summer video. 17. Boys of Summer video.